Open Source Housing: Print your own Tiny House? I’ve been wanting to talk about open source housing for a while now which is something you’ve probably never heard of yet. For a while I’ve known that sometime in the near future housing is going to drastically change thanks to the internet and technology. When I put together this post last year is when I truly realized it. The good part is that this will most likely reduce the price of building a house because it reduces the need for labor and design. 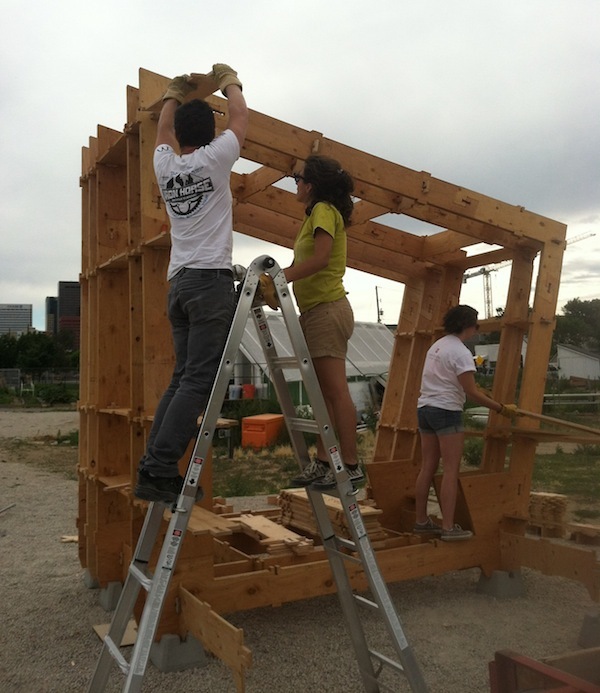 So today I wanted to introduce you to an idea called WikiHouse. It’s open source housing. Like Wikipedia but for real life stuff. The idea is that you would be able to browse and choose through an ever growing amount of house and furniture designs that are free and open source. Open Source Housing Available to All? Yeah! That’s the idea.. You’re able to browse and download any construction set that you want. And if you wanted you can even design your own, use it yourself and also share it with everyone else. The WikiHouse is a plugin for SketchUp that’s available right now and it generates sets of cutting files that make up the parts for your house. And these parts can literally be ‘printed’ from a standard sheet of wood like plywood using a CNC machine nearest you as shown above. Once you get your parts printed from a local CNC it’s time to put it all together. After that it’s time to install other parts like your cladding, insulation, windows and appliances and install them onto your house to complete it, as shown below. They started with some Kickstarter funding. And they didn’t build this open source 150 sq. ft. tiny house for themselves. The project is for a Navajo family in Utah. Let me allow them to tell you the story.. Learn more how open source construction works here. Browse the current open library of homes and parts. Learn how you can create your own designs and contribute to the movement. Download the WikiHouse SketchUp plugin. More tiny housing updates emailed to you daily! If you enjoyed this post on the possible future of housing you’ll love our free daily tiny house newsletter! What about “printing” one out of structural insulated panels? Insulation would be built in, CNC could route for windows, doors, attachment points, etc. Just a thought. Great article! They already pre-cut SIPs for doors, windows, electrical and plumbing penetrations with a CNC style machine. It is pretty cool, take just about any design to Premier SIPs in Fife, WA and they can map it out for SIP construction, pack it up on a flat bed and deliver it to your site. Perfect for tiny home construction. Very tight and well insulated construction. And talk about going up fast; helped put together a 500 sqft house that took 2 hrs to be complete, standing and in the process of installing windows and doors. We had a weather tight structure, with a metal roof on, by sunset! Interesting concept and looks like way more fun than putting one of those 3D wooden dinosaur puzzles together. Some real possibilities there. Will definitely check out WikiHouse. Especially if there’s some knockdown furniture. I am thrilled to see this and reading through the comments there i also wish they had a geodesic dome-design there… but after a hour of letting it sink in, i ask: creating all the cutaway and the milling waste… is this sustainable? While the idea of open source is great, sharing a conventional 2×4 frame design on the internet is the same thing, a lot more accessible and a lot cheaper. This is an interesting proof of concept idea, but it is wasteful and unsustainable. Which is easier to manufacture? a 2×4 or a sheet of plywood. Which uses more parts of the tree? Love this idea but then go back to what you were doing and rethink again how housing should be created without special tools, without special wood, without harming the environment. I disagree with the wording above. What I see here is that this sheet of wood is clearly CUT not “printed”!!! You’re right about the wording, Simon, thanks for the clarification and I apologize for the confusion. What an innovative idea to get you going on your own TH. I can see this idea expanding in the future to incorporate wiring and plumbing etc. How about a 3d cementatious printer? Imagine a cement pumper truck hooked up to your printer! Older post: 100 Sq. Ft. Prefab NOMAD Micro Home: Could You Live this Small?